Are you hosting the next party? Consider using dry ice in your drinks for fun and flair at your next occasion. With summer weekends in full swing throughout June and July, now is the perfect time to get outside and enjoy a night of great food and festive drinks with friends. Are you hosting the next party? Consider using dry ice in your drinks for fun and flair at your next occasion. Dry ice is a simple and eye-catching way to add a touch of fun to your cocktails with a theatrical, smokey look. If you’re hosting the next summer party, consider many ways in which dry ice can enhance the look of your libations. As a chilly and fun accessory to your cocktail, dry ice gives your drink a festive look for any occasion. Dry ice creates a distinct fog and bubble to your drink, making a simple mixed drink look like a formal concoction. Perfect for smokey cocktails at summer get-togethers and spooky, cauldron-like mixed drinks at Halloween parties, dry ice is a festive addition to make any drink fun and exciting for any occasion throughout the year. Although dry ice may look and feel exotic in your drink, it has a subtle and almost unnoticeable flavor. 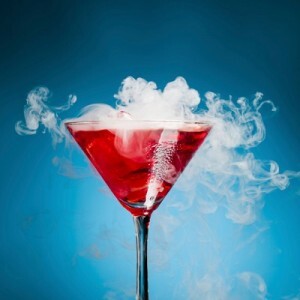 While dry ice may change the presentation of your drinks, it maintains all of the flavors and a chilly temperature of your cocktail, so your drink stays enjoyable down to the last sip. Despite its fun appearance, dry ice can be potentially dangerous if handled without the proper safety measures. Dry ice swizzle sticks are the solution for adding dry ice to your drink, allowing you to use it safely without touching the ice or swallowing it. By keeping the dry ice safely enclosed and secured, these swizzle sticks allow you to add a fun look to your drink without worrying about the hazard of burning your hands or mouth with direct contact. Dry Ice is the Perfect Solution! For more tips on transforming your kitchen with the help of dry ice, turn to the specialists at Dry Ice Corp today! Dry Ice Corp is the largest regional supplier of dry ice and related products in the Northeastern United States. Our dry ice is fresh and delivered right to your doorstep. We are happy to help you determine the best way to ship your goods, whether you have a huge amount of cookies or a single pie, and help you select the perfect amount of dry ice for the job. Give us a call at (201) 767-3200 or contact us online for a quote. To connect with us online, be sure to follow us on Facebook, Google+, Pinterest, and Twitter. This entry was posted on Friday, June 8th, 2018	at 2:20 PM	and is filed under Many Uses of Dry Ice	. You can follow any responses to this entry through the RSS 2.0	feed. Both comments and pings are currently closed.